7km northwest of Banlung town, Katieng Waterfall is a classic Ratanakiri favourite. The top pool of water cascades down over a rock shelf into a large pool below. Admire the forest views from the top or take the wooden stairs down for a dip at the bottom. The water is cooling, and the large rock face allows you to sit behind the waterfall as it flows from the top. Katieng Waterfall is managed by the local Indigenous community and the small entry fee supports the nearby villages. Escape the urban rush and experience the unique culture of the Tampuan tribal villages. 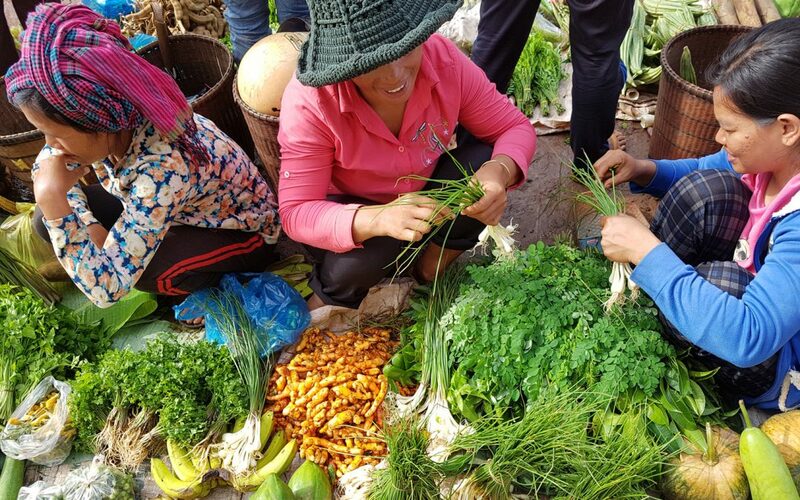 By immersing yourself in local culture you will gain a deeper understanding of rural life in Cambodia. Learn about the spiritual significance that the Yeak Laom region holds for the Tampuan, try your hand at traditional crafts, and sample the local cuisine over dinner with your hosts. The Yeak Laom is perfect place to reconnect with nature. You can explore the local landscapes and protected wildlife areas, or swim in the crater lake, before discovering waterfalls hidden amongst the jungle. The Cardomom Mountains are a biodiversity hot spot for international tourists. This mountain is one of the last remaining wildlife corridors in the region and home to leopards, tigers, elephant, sun bears, gibbons, and Siamese crocodiles. The project was established to protect the forest from illegal logging, hunting and clearing for farms which threatens of the ecosystem. It was founded in October 2008 in order to provide sustainable alternative livelihoods to local people while reducing threats to local natural resources. Virachey National Park was established in 2004.it was initiated by the Ministry of Environment under the project “Biodiversity and protected Areas Management Project with the fund support from the World bank. Virachey National Park is the largest National Park among seven other National Parks in Cambodia. It offers an incredible insight into the variety of Cambodia’s remaining wilderness and wildlife. The main objectives of CBET were to encourage the local community to participate to protect and conserve its environment and biodiversity for the future. Travelling in the Virachey park is a very unique experience; you are deep into the heart of nature. Preah Rumkel community based project is located near the Laos border in Stung Treng Province. The village is beside the Mekong river, where you can admire the Irrawaddy Dolphins and explore the many small surrounding islands. This is a good destination for relaxing near the Mekong river and enjoying bird watching in the forest. This area offers a gateway to the Sopheakmith waterfalls, a very unique place in Cambodia. You can also find out the legend of Preah Rumkel in the Pagoda Wat Damrei Sor or the White House Elephant. We may be biased, but we reckon that whatever your age, whatever your life experience and whatever the purpose, duration or type of vacation you imagined, sustainable tourism in the Kingdom of Wonder might just change the way you travel forever. With a range of homestays and carefully selected ecotourism sites in beautiful locations throughout Cambodia, there is something for every style and taste.